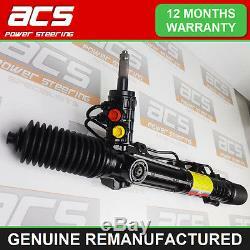 BMW 3 Series E46 Power Steering Rack to fit models.. 09.1998 > 04.2007. Comes with 12 Month Unlimited Mileage Guarantee. Please Call 01827 259699 For Advice On Purchasing The Correct Part! We will collect your old unit FREE of charge from UK mainland Excludes Postcodes. (BT, AB, IV, HS, KA, KW, PA, PH, ZE). All New Seals - All New Boots - All New O-Rings. All New Teflon Rings - Inner Tie Rods NOT Included - Then Resprayed With Protective Paint. All Above Components Equal or Exceed O. All Units Are 100% Tested For Quality Assurance Purposes. To see images of our Remanufacturing process! Are these used items cleaned up and sent out? These items have been stripped, cleaned and rebuilt with new parts that equal or exceed O. Quality, then are rigorously tested on our functional test rig. Are there any extra costs? When you have received your new/remanufactured steering rack from us and the old one is ready for collection give us a call 01827 259699 and we will arrange our courier to collect it from you. Of charge from UK Mainland Excludes. (BT, IV, HS, KA, KW, PA, PH, ZE). We have a rigorous Recycling Program that is important for us to abide by. Postcodes (BT, IV, HS, KA, KW, PA, PH, ZE) may incur an additional cost. We dispatch all items on a 24 hour courier. Any items dispatched on a friday will usually be received on the following monday. Please contact our sales team. Postal Order - Made payable to "ACS Midlands Ltd". Cash - Cash on collection. If theres a problem with a part you must notify us within the 14 days from date of receipt. Feedback We leave feedback automatically after it's been received. When you have received your new/remanufactured unit from us and you have taken the old one of the vehicle simply box it in the same box your new/remanufactured unit came in then simply give us a call on 01827 259699 and we will arrange our courier to collect it from you FREE of charge from UK Mainland Excludes Postcodes (BT, IV, HS, KA, KW, PA, PH, ZE). About Us ACS Power Steering are a leading company in remanufacturing Power steering racks, pumps and boxes for all cars and light commercial vehicles. With over 25 years experience in the motor trade. To see our remanufacturing process! We pride ourselves on our customer service. This listing is currently undergoing maintenance, we apologise for any inconvenience caused. 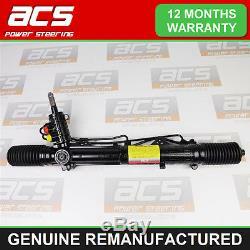 The item "BMW 3 SERIES E46 POWER STEERING RACK 316, 318, 320 1998 TO 2007" is in sale since Thursday, January 03, 2013. This item is in the category "Vehicle Parts & Accessories\Car Parts\Suspension & Steering\Steering Racks & Boxes".